The event shown in this painting is the surrender of British General John Burgoyne at Saratoga, New York on October 17, 1777. 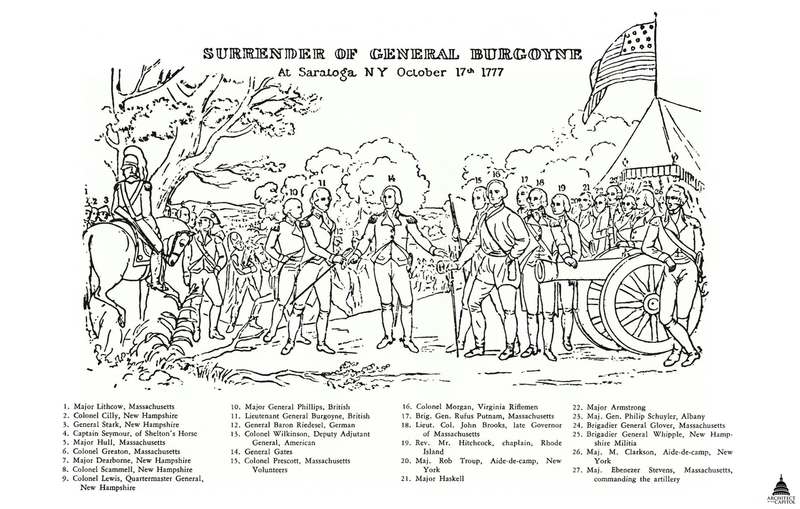 Burgoyne's surrender followed battles with American General Horatio Gates near Saratoga in September and October 1777. With the British losing men and defenses during both engagements, Burgoyne retreated with a weakened army to Saratoga, where he surrendered to General Gates. This turning point in the American Revolution prevented the British from dividing New England from the rest of the colonies, and it was the deciding factor in bringing active French support to the American cause. This painting depicts General Burgoyne prepared to surrender his sword to General Gates. Gates, showing respect for Burgoyne, refuses to take the sword and instead offers hospitality by directing Burgoyne to the tent to take refreshment; the American flag flies in the wind at the top of the tent. American officers gather at the sides to witness the event; their varied dress reflects their different units. In the center of the painting, and extending into the background, is Burgoyne's army along with its German reinforcements. They were directed to the camp by American Colonel Lewis, Quartermaster-General, who rides on horseback in the far distance. The scene suggests peace rather than combat or hostility: beneath blue sky and white clouds, officers wear their dress uniforms, weapons are sheathed or slung, and cannons stand silent. Burgoyne's surrender was among the subjects John Trumbull selected for a series of history paintings when he began to "meditate seriously the subjects of national history, of events of the Revolution," in 1785. In September of that year, Trumbull wrote his brother that he was thinking of scenes related to battles of Bunker’s Hill, Trenton, Saratoga, and Yorktown. In 1791, he sketched a landscape study for the surrender site at Saratoga. In creating the painting for the Capitol, he included the same large tree in the left foreground and many other topographical features but added more trees and autumnal leaves. Trumbull based most of the figures on portraits he painted from life in the early 1790s. The Surrender of General Burgoyne was completed in December 1821 and was exhibited in New York City from January to March of the following year. Trumbull performed the first cleaning and restoration of his Rotunda paintings in 1828, applying wax to their backs to protect them from dampness and cleaning and re-varnishing their surfaces. At the time, Trumbull also repaired damage to the right foot of Colonel Daniel Morgan (dressed in white and standing at the head of the officers gathered at the tent), which was cut out with a sharp instrument, most likely a penknife. Throughout the 19th and 20th centuries the painting was cleaned, restored, varnished, and relined. All of the Rotunda paintings were most recently cleaned in 2008. Between 1822 and 1832, Trumbull created a smaller version of this painting that is now part of the collection of Yale University Art Gallery. The painting in the Capitol and the later version are similar in composition but differ in details. In the later version Trumbull made changes to the facial features and expressions of figures, the direction the flag blows, and the topography of the landscape. It was Trumbull’s version for the U.S. Capitol that appeared on a $1.00 stamp in 1994.